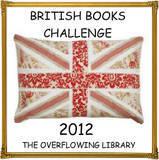 I am delighted to announce that I am hosting the 2012 British Books Challenge at The Overflowing Library taking over from the wonderful Becky at The Bookette who has decided not to carry on hosting the challenge in 2012. A huge thanks to Becky for letting take on her challenge and letting me shamelessly steal her ideas and work from all the fantastic things she did with the Challenge last year. The books can be in print or out. Old or new titles. They can be from any genre and for any age. My blog is obviously focused on YA literature but you are welcome to read adult or children's novels if you wish. 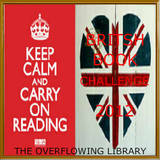 If you sign up for the Challenge you will be aiming to read at least 12 books by British Authors (which works out to one a month). For every book you review each month you will get an entry into the draw to win a monthly prize pack. Therefore the more you read the more entries you will rack up. Towards the end of the year I hope to do some kind of special prize draw for those who have gone to the most effort over the year managing to read 50 or more British Books. Insert your choice of buttons onto your sign bar. You will see there is a selection of them below the sign up form at the bottom of this post (which were design by Book Angel Emma - thank you lovely). Save the one you like onto your computer. Then go to add gadget on your sidebar to put the picture on your blog adding a hyperlink to it of the url address for this post. Fill out the form below. 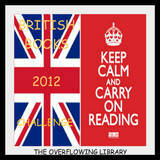 I will add you and your sign up post / page to my British Books Challenge page in due course. 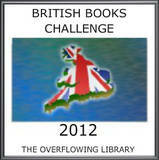 And finally, as you review the books on your blog, update your sign up post/ page with a link to your review. Every link up you do will be an entry into each month's prize pack (although some of the prizes may be donated by publishers only willing to send to the UK). I am absolutely delighted to tell you I have had a huge amount of support and encouragement in the planning of this challenge from UK publishers. Watch out for the review link up post each month for details of what you could win. If you are a publisher who publishes books by British authors or British author who would be interesting in promoting their titles through the British Books Challenge giveaways please contact me. I'd love to participate but are cross-overs with other challenges allowed? 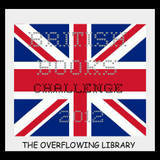 I have signed up for this - my first challenge - I am a little nervous, hoping everything hyperlinks properly!!! I would like to read some books I already have, hope that's ok? I have listed the first two. Somehow your post gave me the courage to jump in! As far as I can tell, Americans are allowed to participate as long as we are OK potentially not being eligible for prizes (fine by me), right? In which case, I entered and I'm excited to expand my reading horizons to the other side of the Atlantic. Signed -up. Thanks for hosting it. I'm having trouble getting the picture to show up on my blog - can someone help me out with how to do it? I have already signed signed up for the challenge, but my entry does not show up here, did I miss something? Just stumbled onto your blog and this amazing challenge! I have entered (hope it's not too late!) and cannot wait to get involved in this ... :) Thank you for hosting!